How to Select the Type of Charter That is Right for You! Globe Merchant is unique in that we offer many different types of charters. It's not always easy to distinguish between the different kinds of charters and determining which one is right for you. Below is an outline of the different types of charters. Bareboat(w/ Skipper)- A bareboat charter is when you hire a yacht by itself. It is the same concept as renting a car. You get the yacht(and a skipper if you like), and can travel to the islands you choose and set your own itinerary. In most cases your group will be the only ones on the yacht, but I've set up a page for people who are looking to share a yacht with other people. Sharing a yacht is advantageous because you can usually get a larger yacht for the same price or even less than if you were on it alone. The disadvantage is that you will be spending time with people that you don't know. The real advantage of a bareboat is that you have the freedom to set your itinerary. If you choose to hire a skipper, you will have the added advantage of a 24 hour guide who has a lot of knowledge about Greece and can show you(or point you in the right direction of) places that you would be hardpressed to find on your own. 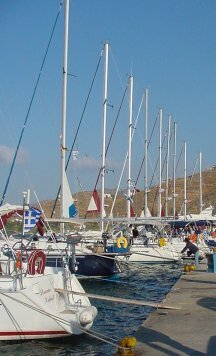 On the way to the islands you will be learning from the skipper all about Greece and most of your questions he'll be able to answer. Keep in mind that he is not trained as a "guide", but because he has spent so much time there he has acquired a wealth of information. The bareboats will range in size from 30-60 feet and generally run from Saturday to Saturday. You can charter them one way, but it usually is a lot more expensive to do it and a lot of times the companies won't offer the yacht one way since it might be difficult for them to get it back to it's starting point in time for the next charter. If you choose to hire a skipper, his daily rate is approx. 120-130 Euro per day(depending on the company) and some companies require you to pay for the skipper's food. Skipper/Owner- A Skipper/Owner is very similar to a bareboat with the difference being that the skipper will come with the yacht. 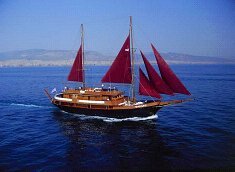 In some cases there is also a crew included in the rates and some skipper/owners offer half board(breakfast and lunch). These yachts are generally over 50 feet in length. Some skipper/owners will charter any number of days and start the charter any day of the week. Cabin Charter- A cabin charter is when you rent a berth(bed) or cabin on a larger yacht. The yachts that cabin charter are generally from 50 feet to over 100 feet and hold a minimum of 8-10 people and a maximum of 50. Normally they offer offer some sort of boarding program(either all meals or selected meals). Charter yachts have a set itinerary and generally visit the more well known locations. Some of the yachts are motorsailers and some are motor yachts. Flotilla- A flotilla is for someone who has the ability to sail a yacht, but is not completely confident about sailing in unknown waters. You will charter a bareboat yacht for it's normal rate and pay an extra fee to be included in the flotilla. The flotilla will have a lead boat with a skipper who will help set the itinerary and meet with the yachts on a daily basis to orient them with what to expect on the next leg. This is a great way to gain confidence, but has the disadvantage of taking away your autonomy in that you will have to follow the itinerary of the group. One way of overcoming that is to sail with the flotilla for one week and then go off on your own for the second week.